Our recent showings at the tradeshows BIRTV in Beijing and IBC in Amsterdam have led to some sneak peeks at upcoming products as well as unveilings of others. Stay tuned for more updates and possible unveilings when we visit Camerimage, ProFusion, and Inter BEE in November! Newsshooter visited us at BIRTV and previewed a nearly final build of the Nucleus Nano wireless follow focus system designed specifically for handheld gimbals and smaller camera setups. It works with our own G2X handheld gimbal and units from other manufacturers. Cinema5D took a first look at our forthcoming TE-ND digital neutral density (ND) variable filter PL mount adapter for RED cameras. 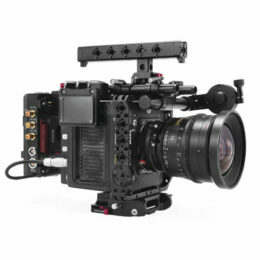 The prototype unit was shown at BIRTV in Beijing and IBC Amsterdam. Curious to know if that micro follow focus will be able to control lenses fit on an Eva1?